How are you using Logbook? Logbook is where all your File Notes, Tasks, Messages, Documents and uReports are recorded and saved. It can be accessed in every section of Wisenet by simply clicking on Logbook from the Left Navigation Bar where you can view all your logbook records displayed as an event Timeline. Logbook goes hand in hand with Learncycles, which lets you automate and standardise normal processes in the learner lifecycle by creating documents, tasks, and messages automatically when enrolments meet your custom trigger conditions. Document collection, archiving and generation are vital activities during the lifecycle of a Learner. It is important that document management is easy, transparent and always available. Wisenet allows you to upload and download documents as well as use reports to generate them directly from within the application as part of the Logbook feature. File Notes let you log any information about a record such as general notes, logging calls / interactions, uploading documents, and generating document using uReport. They can contain rich text, images and web links and you can upload up to 10 files per File Note. You can add File Notes at a Learner level, Course Enrolment level and Unit Enrolment level. Tasks allows tracking of activities required to complete work-related goals. They can be assigned to individuals or groups, with details of who it is assigned by and have deadlines and priorities. They can be added individually as needed, or automatically using Learncycles based on trigger events. You can add Tasks at a Learner level, Course Enrolment level and Unit Enrolment level. Wisenet can send email messages in many different contexts. Learn more to see some examples of how you can use the Messaging feature. uReport is an easy way to build and generate document templates such as Credentials, Letters of Offer, Welcome Letters, CAN’s, Training Plan and other General templates. 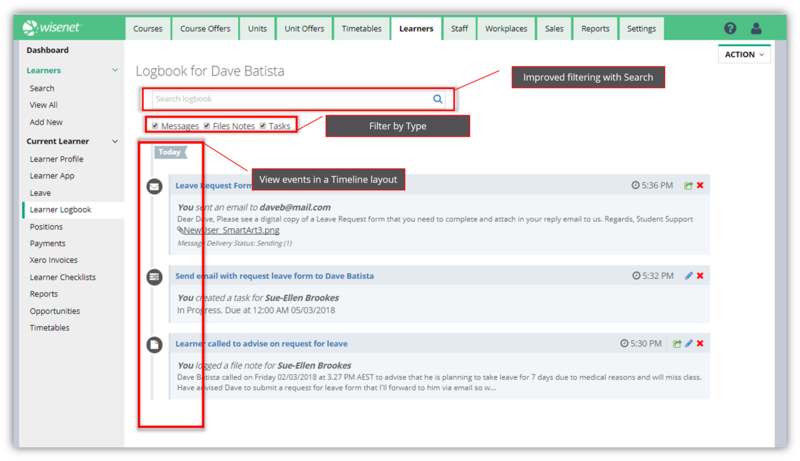 Activities to the Sales Logbook can also be created when you are adding a Sales Contact by clicking on the Add Activity button.